The ever-growing commercial vehicle market is expected to quadruple in sales by 2017, and Ford, North America's best-selling commercial vehicle nameplate, plans to be one of the reasons for its stellar increase. The 2014 Ford Transit and Transit Connect cement the brand's contributions with their top-of-the-line upgrades, including the brand-new Transit Connect Wagon, multiple model and configuration options, and fuel efficient powertrains. 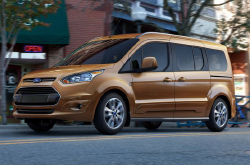 Discover more about the 2014 Ford Transit in Dallas below, then read on for additional details on its specifications. With the ability to tow up to 2,000 pounds and maintain a car-like driving experience, the Transit Connect Wagon is an ideal choice for buyers interested in purchasing a small-sized van with versatility. Available in two wheel-bases, the wagon can fit either five or seven passengers comfortably, and features foldable second- and third-row benches draped in leather or cloth seating. A 2.5L DOHC four-cylinder engine and 1.6L EcoBoost four-cylinder power the van, while adaptive cruise control, AdvanceTrac stability control and Blind Spot Information System take care of its safety needs. Optimized to satisfy buyers with varying tastes, the Transit comes in van, wagon, chassis cab and cutaway variations, as well as two wheelbases, three lengths and three different roof heights. Those in need of little cargo space can take advantage of the 56-inch height option, whereas shoppers searching for additional space can choose the 81-inch option. If that's not appealing, the van also offers between 256 and 550 cubic feet of cargo volume, which can be accessed through two cargo doors located on the rear. Keeping to their eco-friendly standards, Ford has outfitted the Transit with a fuel efficient 3.7L V-6 engine, a 3.5L EcoBoost V-6, admired by many 2014 Ford Transit reviews, and a 3.2L PowerStroke Turbo Diesel, equipped with a high-powered emissions system. The Transit Connect is powered by a 2.5L DOHC four-cylinder and a 1.6L EcoBoost engine. 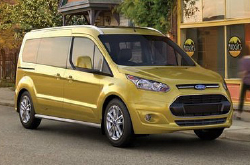 Compare the 2014 Ford Transit Connect against vehicles like the 2014 Nissan NV, RAM Cargo, Chevy Express, Ford Econoline and the Mercedes Benz Sprinter, and we're sure you'll discover that the Transit Connect wins over the competition in several areas. The Transit Connect's got several positive attributes, including its passenger-oriented features and exquisite design. Many drivers in Dallas choose it because it's a truly outstanding value; compare its price to the competition to see for yourself. Check out the Transit Connect bullet list below this paragraph for more quick facts. Thank you for selecting Grapevine Ford as your source for 2014 Ford Transit Connect reviews. Not all Dallas car franchises are alike. We differ from others in that we feel it's our obligation to supply customers with quality reviews. Everything perspective car buyers need to make informed decisions is right here, including info regarding safety technologies and other specs. Each article is packed with beneficial facts and specs - all at your fingertips. 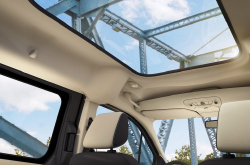 After reading our review of the Transit Connect, find out about current financing offers that'll help you save substantially on your purchase at our Ford dealership in Dallas.